Pecan pie is probably my all-time favorite pie. Unfortunately because this pie is almost always made with corn syrup I usually either forgo it or eat it and then feel bad about myself. But I have found a way to make my pie and eat it too. Pecan pie with no corn syrup. No GMOs to worry about and replacing it with a healthy substitute. That’s win-win in my book! I started with this recipe. As you are probably aware, I can rarely leave a recipe as is. So I used pure maple syrup instead of the cane syrup they used. I also cut back on the sugar from 1 cup to ¾ of a cup. (As it turns out, it was still too sweet and next time I’ll scale back even further on the sugar.) Other than that, I left it as is. I will admit that I used a store bought pie crust for this. (Serious kung faux pas.) But in my defense, I am mom to a now-crawling baby and am short on time and was not playing super mom that day. And it was an organic crust! The pie turned out looking beautiful. (A little too perfect looking, thanks to the crust, but oh well. This post is not about the crust.) I was amazed. I delivered it to my Superbowl party friends with both pride and trepidation, because you are never sure how a pie turned out until it’s tasted. And bringing a pie with a slice missing to a friend’s house is just bad form. The texture of the filling turned out nicely. Maybe not quite as spongy as is achieved with corn syrup, but it delivered on flavor and the texture was good. We felt like it did need more filling for the size of the pie and the amount of pecans, though, so I will probably ramp up the maple syrup and eggs for round two while still reducing the sugar. As I mentioned, it was very sweet. 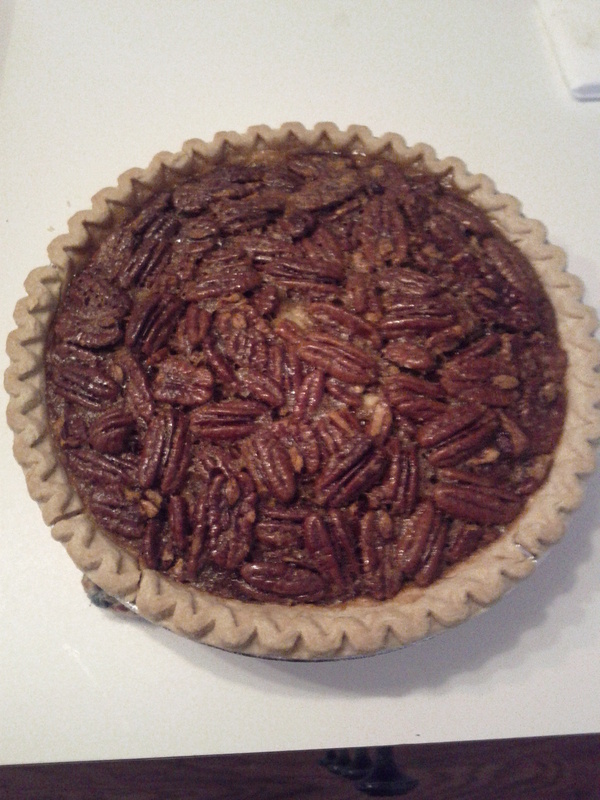 In the end it was a successful first-time pecan pie. Yes, it was my first. And here’s another factoid – last Thanksgiving I made my first pumpkin pie. Shocking!! I recommend giving this recipe a whirl and adding your own flair to it. It’s definitely a great place to start for a corn syrup free Southern pee-can pie!